A wonderful week passed away with lots of new launch and leaks coming our way from the Mobile industries. Main highlights of this week was WWDC 2016. Apple has launched iOS 10 in the event with lots of changes and updates. From the Android point of view OnePlus 3 has been launched with 6GB of RAM and is available for grabbing online (Through Amazon in India). So let’s start and find out what all are the five big news from the tech industry this week. With lot of leaks and talk OnePlus has finally launched its flagship device OnePlus 3 on Tuesday. The company's fourth smartphone is priced at Rs. 27,999 in India, and while it was scheduled to be available at 12:30am IST via Amazon India, it is already available with a 'lightning deal'. The device is well specs and can be really called as a flagship killer. OnePlus 3 is powered with Qualcomm Snapdragon 820 SoC (two cores clocked at 2.2GHz, and two cores clocked at 1.6GHz) with Adreno 530 GPU on board, and 6GB of LPDDR4 RAM, and 64 GB of in-built memory. While it supports a USB 2.0 Type-C port, it does have a 3.5mm headphone jack in addition. Like the earlier version of the device the smartphone features a home button which sports a fingerprint sensor. It also comes with capacitive hardware keys, apart from the Alert Slider. Apple has launched its new OS at WWDC for iPhone and iPads. iOS 10 is capable of doing more things than the earlier version of the OS. There are some cool improvements for using 3D touch. The notification panel has been redesigned. Adding to this the Apple has also introduced the new version of Watch OS and MAC in the event. These are the top news from the last week in the Tech industry. 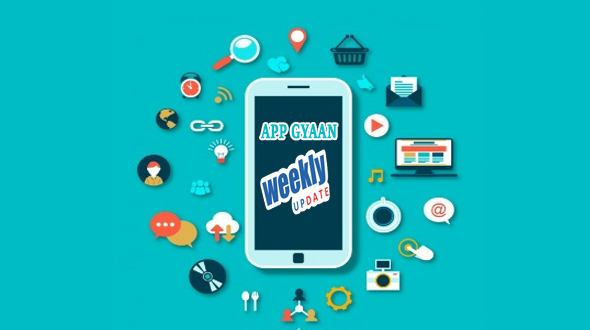 We be back with all the latest update of coming week again till then enjoy the articles of App Gyaan.